Grab a brownie with one hand and a slab of pecan pie with the other…now stuff them in your mouth! That’s what you pictured in your head, right? We’re going to keep the joy of eating that you’re imagining, but lose the mess. So, Two Fisted Eating. At each meal, your goal is to put 4 “fists” on your plate. TWO fist sized portions of “real food” (as I like to call it) and TWO fists worth of vegetables (remember Veggie Rule #1?). 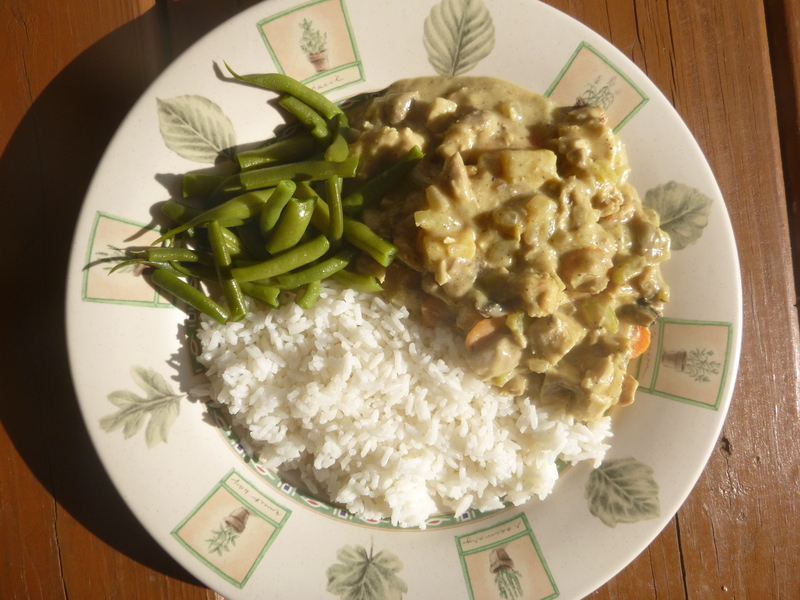 Let me give you an example; this is the Turkey Curry recipe. The plate on the left is what my plate looked like a year ago. Notice that the green section looks more like a decoration – an afterthought – than a part of the meal. The picture on the right is what I ate for dinner this week. 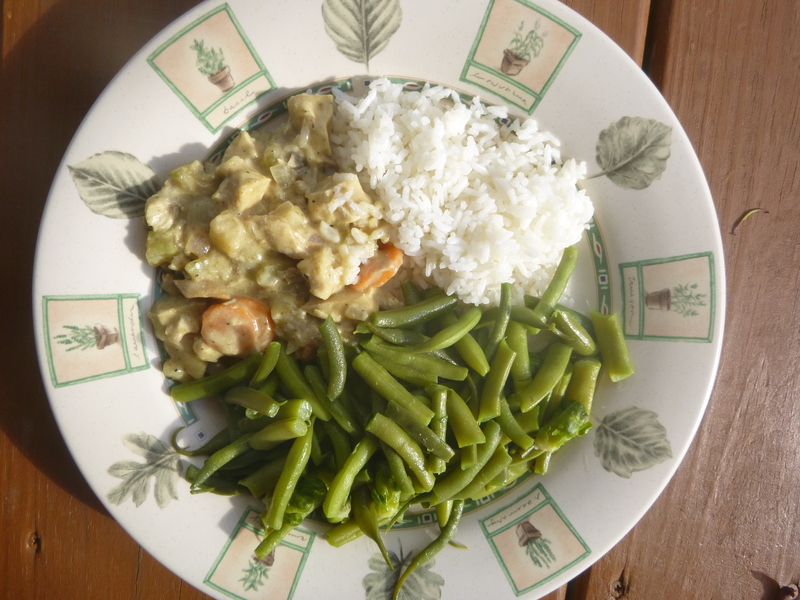 TWO fists of “real” food (rice and Turkey Curry) and TWO fists of veggies. Now, THIS IS IMPORTANT: RED ALERT! RED ALERT! Ready? When your plate is empty, you stop eating. It’s that simple and it’s that hard. Drink some water, drink some tea, start the dishes, lick the plate and cry… whatever works for you, just don’t get seconds (unless it’s vegetable soup, then you can go back for thirds for all I care). When you look at the food on your plate, especially if it’s less than the amount you’re used to eating, what problem comes to mind? I’m going to be hungry in two hours! (News flash! I feel hungry two hours later no matter how much or how little I eat!) Don’t fear the hunger; you know it’s coming, so be ready. Eat TWO fists of fruits or veggies as a snack. By the way, I push vegetables rather than fruit simply because fruit has more sugar and therefore more calories. Fruit is good. Very very good. Eat fruit when you crave something sweet, but vegetables are our new best friend. Is a tomato a fruit or a vegetable? My definition is this: if you wouldn’t bake it into a pie, it’s a veggie. Okay, math majors! When does TWO plus TWO not equal four? When they add up to negative numbers on the scale! Thanks Katie!!! After having baby 4 in July, I have been trying to loose weight from all 4 babies!!! I am enjoying reading your posts…..very informative and encouraging. Great advice and entertaining too! So I just stumbled upon this and what a great find! Straight, to the point, and so painfully true! I will absolutely be following and look forward to it! You said after you are done, don’t go get seconds, but I always thought you could eat as many veggies as you want. So could you go back for green beans but not the rice and curry? Great question, Jenn! And the answer is: it depends on your veggies. If your veggies are naked (no butter, no dressing, no extra calories) and low calorie, then by all means, fill up! Green beans, zucchini, carrots, celery, lettuce, etc are all in this category. (Peas and corn, on the other hand, are high-ish in calories (for a veggie) and can add up fast.) The problem is in the flavor, the “good” stuff, that we add to the veggies to make them taste better. An extra helping of green beans is no problem, but the extra butter and salt can be. If you’re maintaining a healthy weight and going back for seconds on veggies works for you, then do it. If you’re trying to form new habits, then breaking the habit of RE-filling your plate with anything, even veggies, is essential. You can always get the beans out for a snack later on! “lick the plate and cry…” – I died. And I love everything I’m reading. Just discovered your blog but I’m sharing it with my mom, sister, and *gulp* husband now!